cheap generic viagra mail order pharmacy Love live music, but can’t stand those bar crowds or coffeehouse clatter? Then check out the Folkey Monkey, a singer-songwriter showcase in Grantville. click here “I know there are folks out there who hate paying good money to hear live music only to find, when they get to the venue, a lot of talkative and usually drunk people who have no real interest in listening. These music lovers are who I’ve tried to bring into the Folkey Monkey, and once they’ve experienced it, they really appreciate it,” said Joe Rathburn, the original Monkey. generic viagra Rathburn is an El Cerrito resident and has been playing professionally since he figured out he could make a living doing what he loves. Rathburn grew up in Michigan, but followed his brother to San Diego after he realized having to sleep in a van (like he did when he traveled doing certain gigs) is a lot easier to do in a California winter! In 1986, he married his wife Mair, a San Diego native and fellow musician, and he’s never looked back to the Big Blue state. Every other Thursday, Rathburn brings his guitar, Jeff Stasny brings percussion accoutrements, and they join a guest singer-songwriter to bring the house down. Over the last 12 years, Rathburn has hosted guests from across the county to across the country. He’s worked with local artists just breaking out, and big names like David Wilcox and Nathan McEuen, son of John McEuen of the Nitty Gritty Dirt Band. “My goal is to bring in the artists and put them on stage outside of their comfort zone, to have a musical interchange,” he said. Through Rathburn’s connections with The Folk Alliance and the music industry from three decades of work, he is approached on a regular basis with requests to play at the Monkey. Rathburn has two main requirements for his guests — they have to be able to play music aside from their own (regularly he will play some of the artists’ songs and they’ll play some of his, along with covers), and they have to be able to improvise. “You have to be able to take what comes — to play in the moment,” he said. Rathburn acknowledges that on the Folkey Monkey stage, anything can happen. “Magic can happen, and sometimes a train wreck can happen,” he joked. Each guest gets to pick their own theme. 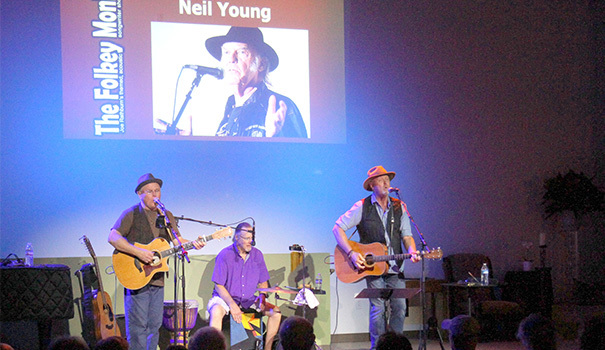 Music nights have ranged from Pete Seeger to Tom Petty to Jimi Hendrix. Upcoming shows include tributes to Paul Simon, Karen Carpenter and John Denver. The “folk” in Folkey Monkey doesn’t necessarily refer to folk music, but to an acoustic style. Think unplugged. Think old-school jamming. “We are heartening back to the hootenanny,” he said. The other important component of the Monkey evenings is the audience. Numbers can range from 50 to 200, but it’s always people who care about the music. “It’s a dream I had from the beginning. I always knew there was an audience out there; I just couldn’t figure out how to find them,” he said. The family-style Monkey crowd has gathered and followed Rathburn through several locations. The “monkey” in the name actually comes from the first venue, the Hot Monkey Love Café, which had monkeys everywhere in the décor. The music night has finally found a permanent home, though, in the Vision Center for Spiritual Living. The Center’s newest location at 4780 Mission Gorge Place boasts a concert sound system, theatrical lighting, high ceiling and even comfortable chairs. There’s always an intermission and opportunity for the audience to interact with the artists. Rathburn points out that it’s a concert together. Him, Stasny, the guest and the audience all doing what they do. The next Folkey Monkey night features guest artist Kodachrome with the theme “The Paul Simon Tribute.” It is at 7 p.m. on Thursday, Oct. 26. For more information or to purchase tickets, visit folkeymonkey.com, like them on Facebook or call 619-871-1563. —Freelance writer Joyell Nevins can be reached at joyellc@gmail.com. You can also follow her Small World, Big God blog at swbgblog.wordpress.com.